How can beliefs, which are immaterial, be about things? How can the body be the seat of thought? 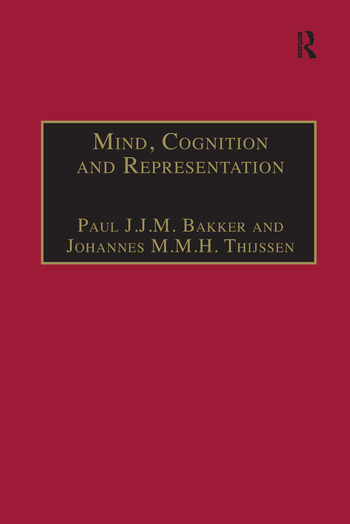 This book traces the historical roots of the cognitive sciences and examines pre-modern conceptualizations of the mind as presented and discussed in the tradition of commentaries on Aristotle's De anima from 1200 until 1650. It explores medieval and Renaissance views on questions which nowadays would be classified under the philosophy of mind, that is, questions regarding the identity and nature of the mind and its cognitive relation to the material world. In exploring the development of scholastic ideas, concepts, arguments, and theories in the tradition of commentaries on De anima, and their relation to modern philosophy, this book dissolves the traditional periodization into Middle Ages, Renaissance and early modern times. By placing key issues in their philosophico-historical context, not only is due attention paid to Aristotle's own views, but also to those of hitherto little-studied medieval and Renaissance commentators. Contents: Introduction, Paul J.J.M. Bakker and Johannes M.M.H. Thijssen; The mind-soul problem, Robert Pasnau; A short introduction to James of Douai's philosophy of mind, Guy Guldentops; 'The universal living thing is either nothing or posterior'. Radalphus Brito's Quaestiones super Libros De anima, Mary Sirridge; Making Aristotle modern. John Buridan on psychology and language, Henrik Lagerlund; Self-knowledge and self-representation in later medieval psychology, Jack Zupko; Materialism in the philosophy of mind. Nicholas of Amsterdam's Quaestiones De anima, Olaf Pluta; The renaissance debate on the immortality of the soul. Pietro Pomponazzi and the plurality of substantial forms, Lorenzo Casini; Natural philosophy, metaphysics, or something in between? Agostino Nifo, Pietro Pomponazzi, and Marcantonio Genua on the nature and place of the science of the soul, Paul J.J.M. Bakker; SuÃ¡rez on cognitive intentions, Tuomo Aho; Attention please! Theories of selective attention in late Aristotelian and early modern philosophy, Cees Leijenhorst; Bibliography; Index. Dr Paul Bakker is Lecturer in the Faculty of Philosophy, Centre for Medieval and Renaissance Natural Philosophy, Raboud University, Nijmegen, The Netherlands. Johannes Thijssen is Professor of Philosophy and Director of the Center for Medieval and Renaissance Natural Philosophy, Raboud University, Nijmegen, The Netherlands.